If a referee makes a mistake when they post statistics from a CTA match, please post in this thread with the following information. Please make sure you write in detail what the mistake is and what the correction should be. This is a good thread, especially for those reffs that do not seem to post games. This thread is for games that HAVE been posted but display incorrect information for example... wrong winning team, someone is on the wrong team, someone was not added to the stats etc. If you find a ref is not uploading stats, please PM me on these forums. 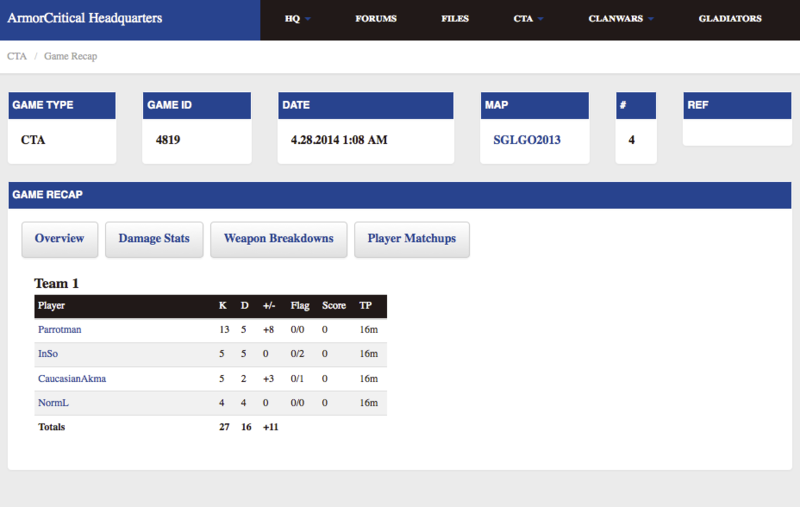 Someone who didn't play at all got a W / L.
This post was last modified: 05-01-2014, 01:17 PM by cyro. I only see the Winning Team's statistics and cannot view both teams. I can see all statistics for a split second so I know they're there. The game ended in LMS. Winning team credited with a loss. This post was last modified: 05-01-2014, 01:43 PM by cyro. Which team won this game? I added the other team in. Who reffed this game? It was not uploaded correctly.